She can't get out of her skin or the area fast enough. She will run and hide, start shaking like it's going to kill her. This only started a couple of years ago and I have no idea why. A laser pointer, camera even a phone camera or if you act like you are going to take her picture she freaks out. We do not have/use a laser pointer. We had one a couple of years ago when we got a cat and since her reaction to it we have never used it. We only played with the cat with the pointer, but then stopped. She has never been teased/tormented with it, when we did have it. I don't get it. It was never a problem before. She would even sit & pose for the camera, now nothing. My Pit is my child along with our other furkids. 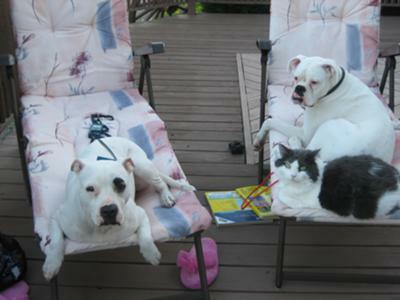 A white Boxer who is not deaf and a cat. Can someone please tell me what I can do to ease her fear so I can start taking her picture again. If I do get a picture of her I have to be sneaky about it and she knows it and they don't come out very well. I want to be able to show off the beautiful dog that she is. She was very sick when this picture was taken and very fat because she was sick. She has a Thyroid problem and will have to take medicine the rest of her life. She looks great now and is back to normal as far as that goes. But I can't get her picture taken. The cat in this picture is no longer with us. He is in heaven now. We do have a new cat that she gets a long with, but we have never used a laser pointer with him either...all though he would love it. Any information would be greatly appreciated. This sounds like the kind of fear based behavior that would respond well to classical counter conditioning. A basic primer on this method can be found in The Cautious Canine by Patricia McConnell. If you decide to use this approach, I hope you'll let us know how it goes. You have a beautiful fur family. I can see why you'd want more pics! Comments for My 7 year old born deaf female is arfraid to have her picture taken. First present the camera in a neutral place with tons of high value treats in your hand. Such as deli turkey, bits of real bacon, or hot dog. Show her the camera, or, ask her to look at it, then when she does, throw her a treat. That's all you do for a week. Then, once she can tolerate that, move it closer and do the same thing until you have it out and she connects the camera with treats. It will take about 2 weeks, but it'll work. My rescue is not a pit, but she is horrified of cameras, flashlights, thunder, smoke alarms and beeping or vibrating cell phones. She was abused before I got her at 4 weeks old. Someone cut off her tail with scissors. Anyway, back to the pics. I started putting the camera on the floor. She is very curious, so she checked it out ALOT. I moved it on the floor from room to room every day for about 2 weeks and now she's better. Not great, but if she can't hear the flash, she will sit for a pic. Daytime pics only as she hates the flash still. Good luck. I hope this helped. Hi Mardie: Just wanted to let you know that you have also received some additional comments on Facebook. I just have to tell you your pitbull is beautiful & so are your other animals.My first pitbull use to go crazy with the laser pointer playing & chaising it then after awhile he got so crazy with it i threw it out. But for months later he would go to the drawer it was it & start barking at it scratching the drawer it was nuts. well good luck & i hope your beautiful girl comes around soon.